Value creation is happening in the buildings industry as systems integrators transition to an open, industry-standard methodology for meta-data tagging and data modeling. The BAS industry is reworking how data is leveraged across the entire design-construction- operations cycle; new applications that use tagged data are being introduced at an accelerated rate; and building owner customers are reaping financial rewards across familiar activities and through new services. How much and how fast? Metcalfe’s Law is one way to predict the gains. 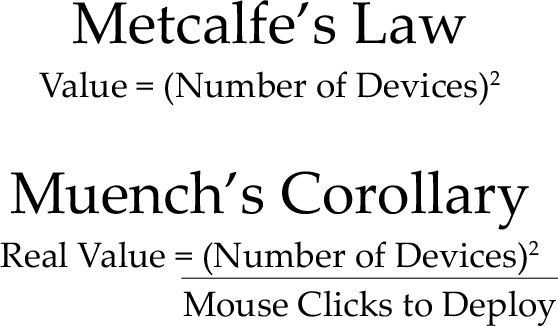 Muench’s Corollary to Metcalfe’s Law - Network value equals the square of the number of connections divided by the number of mouse clicks that it takes to get real work done. In other words, if the amount of effort it takes to tag the thousands of automation system points maintained in historical trend databases is too great, it will take a lot longer to realize value from a data modeling project. This is why J2 Innovations has been focusing its efforts on great software and more efficient workflows. Traditionally, system integrators are responsible for defining automation system points; yet, few of these professionals have ever wrangled with data semantics, meta data tagging and taxonomies. Most have specialized in working on a single brand of building automation system (BAS) and have never encountered the issues that arise when you try to combine data from different sources and bring it into value-added applications. One global facilities management firm audited the many databases storing trend data for building operations and maintenance, and it discovered that it had about 1200 different ways to name a light. 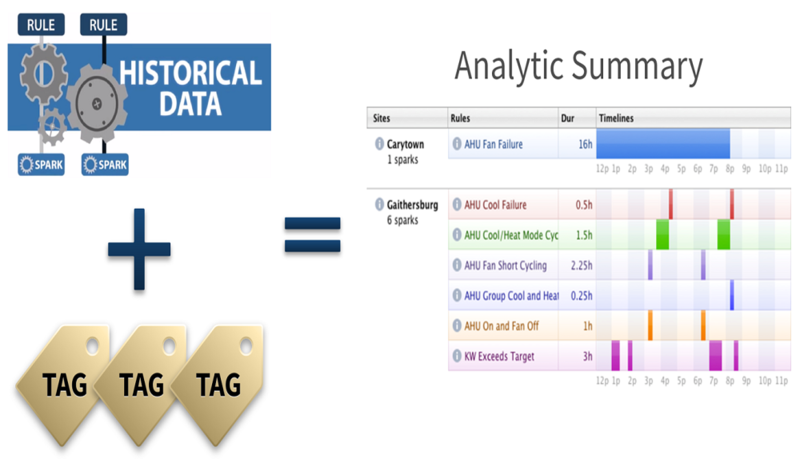 With Project-Haystack methodology and the right tools for automating the meta-tagging process, systematic tagging and data modeling can be a straightforward job, even for a very large data set like this. Will the payoffs be worth the effort? Many times over. One of the most popular implementations of open-source Project Haystack is nHaystack. This module enables Tridium Niagara stations (JACE and WebSupervisor) to serve Haystack data via a RESTful protocol. Using nHaystack, applications receive data complete with essential meta data descriptors. To illustrate, consider how a standard VAV for an air handler would be defined in Haystack. You would start with a device template that associates the points with all the standard attributes: air flow, supply air temperature, damper position, set point. Payoff #1: There is great value in just having this device-level information model at hand when diagnosing a problem. For example, when an occupant calls to report ‘It’s too cold in this room,’ the points graphic would display in a normalized way the live values, independent of how they were defined and named at the control system level. With this knowledge, such situations can be easily and quickly diagnosed and addressed, often without a costly truck roll. Payoff #2: Tags that reflect relationships are also useful, for instance how devices interrelate as part of a larger system. Relationship, or reference, tags can also represent dependencies of equipment to floors, floors to buildings, buildings to enterprise, etc. For example, reference tags can be used to build the hierarchical relationships of all the VAV’s in a particular air handler system. This makes it possible to call up equipment summaries. Anomalies are particularly easy to spot when they are presented in context of other similar devices. Payoff #3: Once you have built a set of self-describing models according to the standard Haystack methodology, you are in a good position to apply Haystack-compliant value-add applications that automatically plug the relevant operational data into the right place. The resulting app provides a user experience for navigation, point graphics, summary graphics, schedules, histories, alarms—in effect, all the information captured in the models delivered to any device anywhere. Clear, non-ambiguous information can go a long way toward simplifying the jobs of maintenance staff and facilities managers which is another way your investment in data modeling will pay back. Payoff #4: The return on investment increases when auto-control functions enabled by a tagged and modeled system come into play. For example, many building operators have the opportunity to save significant energy costs through participation in demand-response programs. However, orchestrating whole-building responsiveness given all the data silos maintained by particular types of equipment and subsystems (HVAC, lighting, enterprise scheduling) has been difficult and costly to implement. By using the Haystack method, you can simply tag models for all of the equipment that needs to be controlled and tag the corresponding control sequence and it will ‘just work.’ This drastically reduces the traditional amount of time, labor and cost required to implement control strategies across the building. Payoff #5: Even more value is derived from an investment in a well-designed and deployed tagging and data modeling strategy when you apply analytics software for automatically analyzing building, energy and equipment data. Data analytics creates value by detecting patterns that represent opportunities for improved performance and cost savings. Automated analytics software will identify issues, patterns, deviations, faults and opportunities at the device, equipment and whole-building levels. Fast action to correct problems and optimize the delivery of building services reduces energy bills and contributes to the type of well-run facility that keeps occupants productive and satisfied with their space. Payoff #6: You can also tag models for better integration of follow-through activities, like issuing maintenance tickets. Likewise, the way all building data is structured in a Haystack-compliant database means easier integration of building operations with other aspects of workplace management in an enterprise setting. Integrating building management within the larger IT infrastructure leads to additional cumulative benefits felt from the C-suite level to every member of the Operations & Maintenance staff. The FIN Framework™ application suite incorporates a unified toolset that makes it easy to do Haystack tagging and data modeling. It enables optimized workflows to perform actions in batch using queries to access data. Users can easily convert the data from all their non-Haystack legacy global and field controllers to Haystack-able models. In this way, they manage server-level conversion of data flows. New Building IoT workflows can be added via edge control devices that already incorporate FIN technology for data tagging, such as the KMC Commander™ Series. Users maintain the ability to work across the entire portfolio as they deploy their applications. While early Building IoT workflows incorporate Haystack technology at the network- or global-controller level, soon it will be more commonplace to have edge devices pre-built with Haystack control. Eventually, requirements will be written into specifications to the effect that all vendors of equipment, meters, other building-connected devices and software adhere to standard tagging and modeling conventions. Every device or piece of software will be delivered with a zip file containing Haystack-compliant data models. With software that leverages tagging and data modeling, we are beginning to greatly reduce the number of mouse clicks required to implement a solution. Following Muench’s Corollary to Metcalfe’s Law, this streamlining of the user experience is unlocking the true value of a connected system. Participation in Project Haystack is giving property managers, building owners and system integrators a big head start in the establishment of an in-house point taxonomy. They can then enforce vendor specifications that call for standardized tagging and data modeling across a portfolio and for all aspects of building operations. Project Haystack is supported by an active and growing open-source community of developers who are collaborating on improving its definitions and modeling methodology. For all these reasons, it is the most future-proof approach to monetizing your building data.